Man! Decorated birdhouses are sooooo old!!! They were cool a year or so ago, but after seeing them in every store I go into, I’m about to puke. You’ve got birdie outhouses, birdie firestations, birdie houses-of-ill-repute. All made with a clunky, who-are-you-trying-to-fool level of detail. The stuff doesn’t even look REAL and the stores are trying to charge $10-15 for it! I think the birds are sick of them too – I have NEVER seen any bird of any type go in any one of those suckers. I even did a test and left a couple out for my parakeets to play with; all they did was freak and burrow under my hair every time I tried to stick them inside! While we’re on the topic, what’s with the artificial resin junk some of them are made out of? Isn’t that stuff going to like, let out toxic gasses when exposed to sunlight and melt a huge honking hole in the ozone layer? Forget the birdhouses. It’s time to move on. That’s what this cool book Barkitecture is about. 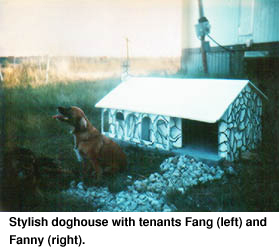 When I was a girl, my dad and I built an incredibly cool doghouse. It was made of plywood, but we cut arches to make a Spanish-style breezeway in the front. The dogs would enter via the “garage” and had a real plexiglass window to look out of. We even painted faux stonework and made a teensy chimney and TV antenna with a 2×4′ scrap, a clothes hanger and some dowels. Dad knew all about antennas, and told me that the design was such that if it had been full scale, it would have really worked. Heh – I can just see those mutts watching Merv Griffin inside their doghouse now! At Christmas time we’d hang little lights on the house. Boy, you should have heard the drunken rednecks screech their pickups to a halt in the middle of the road. They must have sprained their necks while trying to get a good look at the doghouse. And we believed in craftsmanship! We poured a real concrete slab foundtion for the doghouse to sit on. I remember ramming into it a few times at full speed on our miniature tractor, and all the tractor could do was moan and spin its wheels until I got over my terror and cranked it into reverse. Imagine my delight when I ran into Barkitecture in a bookstore. It turns out that Dad and I weren’t the only ones making cool doghouses! This book has doghouses made of dog biscuits, giant Trojan Dog houses, thatched English doghouses. A feast for the eyes! As I said before, kewl doghouses are the way to go. Forget the birdhouses. Get yourself a copy of this book for inspiration and get to work. Make an artistic statement that will really show up in your yard and that Rover will appreciate. Doesn’t the dog on the cover of the book look handsome? Imagine how good your dog would look in the right doghouse! Oh – and one more thing. Go to HenryFields.com and buy a packet of their giant gourds. (Item #5960-141) Those things are supposed to get as big as 100 pounds and maybe 3-5′ around. If you really want to mess with your neighbors’ minds, grow a batch, dry them out, and make some giant “birdhouses” to hang from your trees. Better still, let your Chihuahuas roam the yard in bird costumes and watch the neighbors’ eyes really bug out!